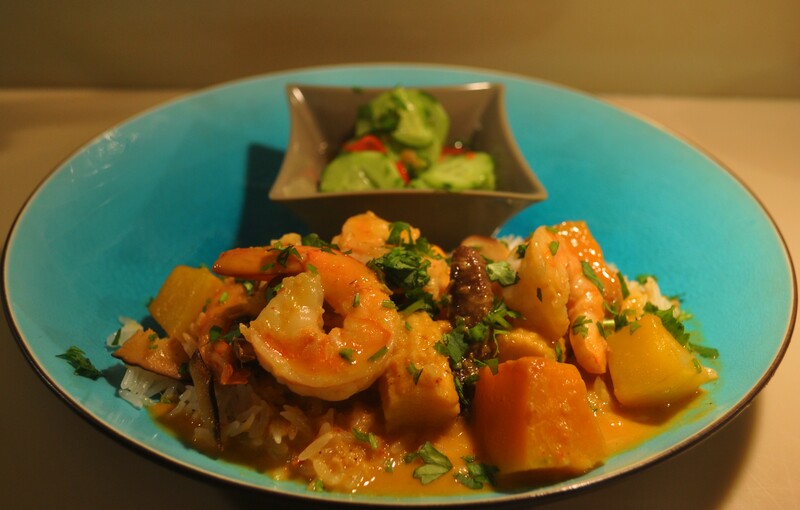 Shrimp and Pumpkin Curry | The Sassy Spoon: Fun Food! 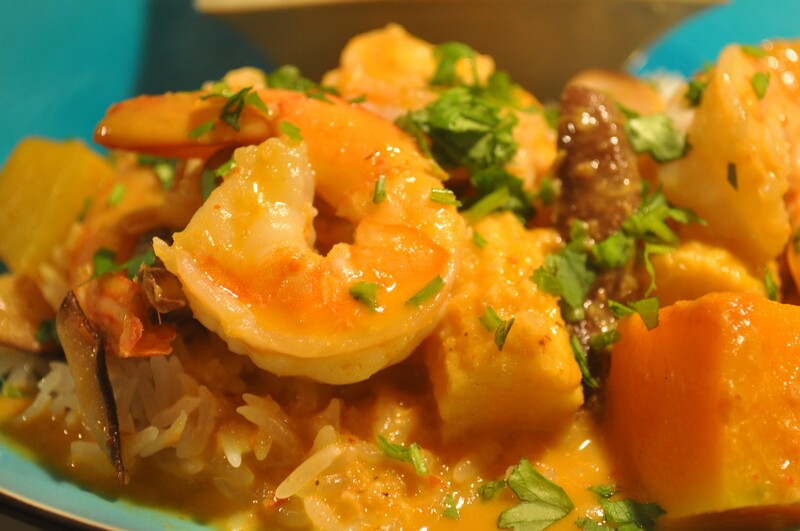 Based on a Thai Pumpkin Curry that I make, this silken & spicy dish definitely qualifies as SASSY in my book. It is easy to make, healthy and makes great leftovers. I steamed some Jasmine Rice with a few Kaffir Lime leaves and made my own sassy version of cucumber salad (recipe to follow on the next blog post.) I used the Japanese Kabocha pumpkin that is abundant year round in Hawaii, but you could use any tender squash or pumpkin. Kabocha is sweeter and more tender than most and you can even eat the skin. It cooks rather quickly as do the shrimp, which makes this a prime recipe to whip up on a week night. The splash of cognac adds another dimension of flavor. Garlic Man is the mascot for The Sassy Spoon! He will be featured somewhere in every post! 2 tablespoons curry paste (You can choose any style of curry paste, I have used yellow, green and red with this before. This time I used red). 6-8 fresh kaffir lime leaves (there is no real substitute for this, but you can use lime zest). In a large hot wok put a large spoon full of the cream from the coconut milk and stir in the curry paste, allow the paste to warm up completely, then pour in one can of the coconut milk & the kaffir leaves, stirring constantly as it thickens. 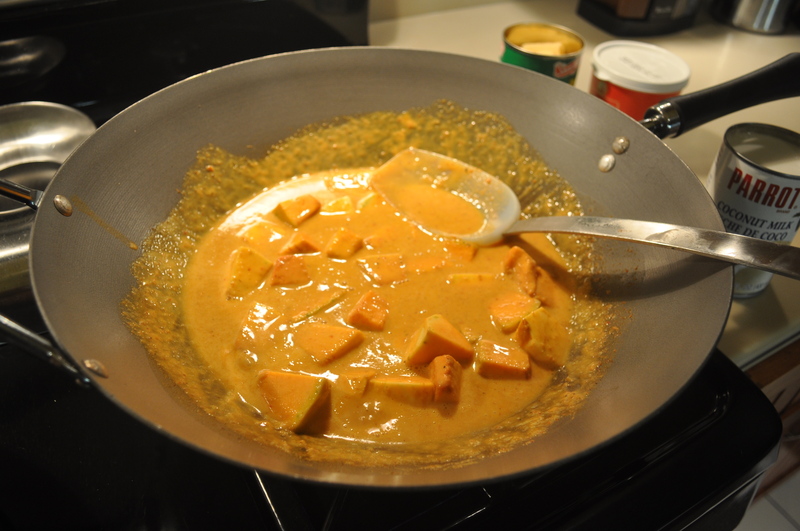 Add pumpkin and cook for 10 minutes, add the second can of coconut milk and the sugar. Check pumpkin to see if it is cooked thoroughly, be careful not to over cook it or the pumpkin will be mushy. Turn off the heat. 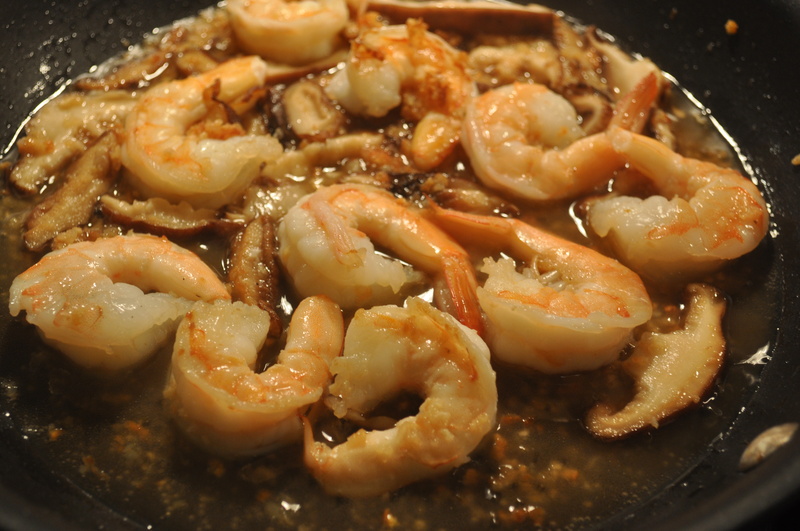 In another pan add the coconut oil, shrimp and mushroom slices. Saute till the shrimp turns pink, about 2-3 minutes. Add the garlic and slightly brown it. Add a splash of cognac and cook for 30 seconds more. Add all of this into the wok, turn the heat back up and simmer for a minute, then sprinkle with cilantro and serve over rice. This sounds delectable. We love pumpkin soup (which I usually make with butternut squash) flavored with Thai spices. The addition of shrimp sounds especially tasty. I’ll have to try this with some of our Alaskan shrimp. Barbara, your soup sounds great too! I just went to your blog… NICE! GORGEOUS–and delicious sounding as well! Tinky! So nice to see you here! Thanks for the comments. If only Susan, Lexi & Bob were here to enjoy this awesome dish with me! 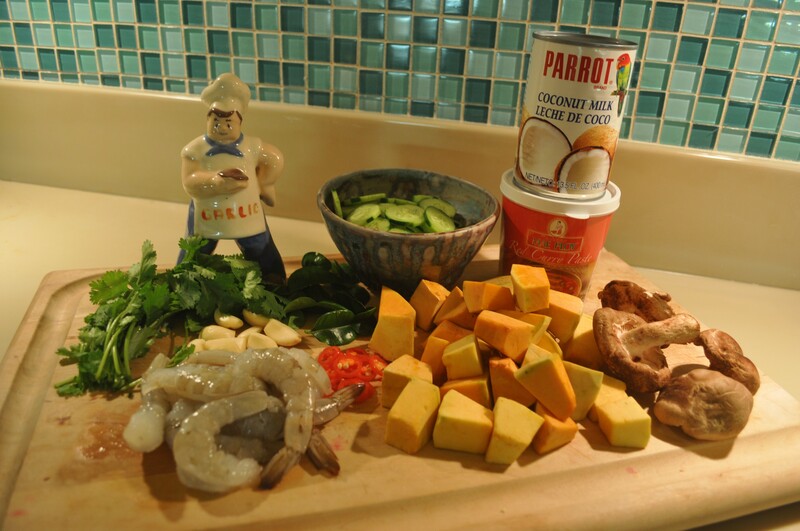 It is exactly the kind of ONO meals we enjoyed as FAMILY…. I can’t wait to share this-and Thank You for your wonderful website! Linda, Thanks for your comments! I am happy to share.